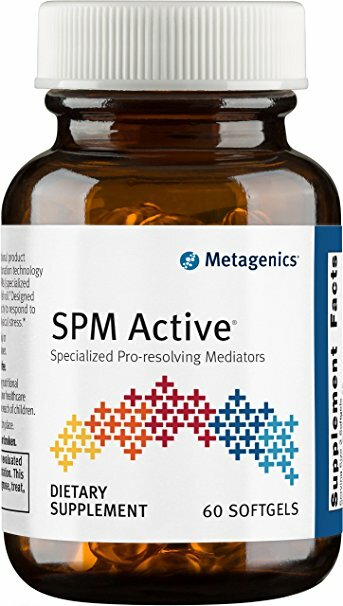 SPM Active, or Specialized Pro-Resolving Mediators, - contains lipids that help resolve inflammation. Atherosclerosis is marked by a persistence of unresolved inflammation and arterial tissue injury. Research documents the emerging role of SPMs in preventing and treating inflammation of cardiovascular disease, in particular by the reduction and/or stabilization of atherosclerotic plaque. Our bodies can derive these pro-resolving lipids from EPA and DHA but at a very limited rate, often insufficient for the amount needed. Moreover, EPA and DHA are needed for crucial functions of their own. While decreasing pro-inflammatory mediators, SPMs also increase the immune defense, resolve infections and facilitate tissue repair. Take one SPM Active soft gel capsule twice daily, for a high Cardiovascular Risk score. Each bottle of Metagenics® SPM Active contains 60 servings.